Groß, mittelkräftig, kraft- und gehaltvoll. Hoher Widerrist, fester Rücken, bei guter Lage etwas kurze Kruppe, sehr gute Winkelungen der Vor- und Hinterhand, korrekte Front, ausgeglichene Brustverhältnisse. Hinten und vorne gering bodenenggehend, raumschaffende Gänge bei freiem Vortritt. Sicheres Wesen, Härte, Mut und Kampftrieb vorhanden. Körung 84: Gute Gesamtverfassung. Härte, Mut und Kampftrieb ausgeprägt; läßt nicht ab. WA 86: Hervorragende Verfassung; läßt ab. My Boy vom Weissenfehner Wald is linebred on Mark (4-3) He has wonderful temperament, great pigment and FABULOUS color! He's one of the stylish ones, but he's absolutely powerful and can also work. There are many females in Mark's pedigree with SchH2 and 3. The breeding recommendation for Mark to improve type, expression and faulty anatomy is quite admirable! 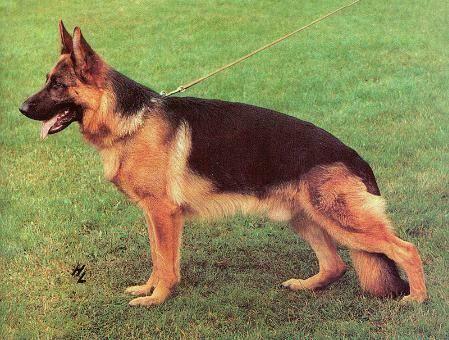 Some males from Mark's line give glamour,but there are some other dogs also which will give the same.A male strongly line bred to Odin Tannemeise should also do the same. Thank you for your feedback. I have a female who has exceptional anatomical construction and movement absolutely firm and dry great character but needs correction in colour, pigment and glamour department. She is a complete outcross so I felt I needed to line breed if and where possible. One of the dogs I am considering would allow me to line breed her to Mark. I come from a country where schutzhund is not done much nor is it required for V ratings, however, temperament is important to me. I totally agree with the last two posts. Marks a beautiful dog that passes on those good looks to his progeny. Mr.Preston says it all.A great dog...a great producer...one of the best ever. He carried a heavy dose of the highly valued and respected Lasso de Val Sole, a very hard animal physically and mentallly who had perfect or near perfect proportions, terrific topline, and awesome movement. Mark has been reputed to contribute male type, proportions, pigment and class. If you want to win a beauty contest with your shepherds you probably will need a significant dose of Mark. One of the greatest producers of all time, appearing often in pedigrees of the top lines now. Beautiful dog. Can anyone tell me what virtues you will get from line breeding on Mark?